Like fruit, vegetables have been popular subjects with artists since the Romans frescoed their houses with images of food preparation (see the bulb of garlic in a wall painting, 50-75 AD, Getty Villa, Malibu). However, where fruit is decorative, colourful, and traditionally highly symbolic, vegetables tend to be painted because they are cheap and available, don’t degrade as fast as fruit and flowers, represent the humble and ordinary, and enable some subtle and earthy colour harmonies. Van Gogh, for instance, painted a wicker basket of carrots, leeks, potatoes and onions (1885, Landsberg/Lech), and Vanessa Bell includes a trug of vegetables in her wall painting of the Nativity, Berwick Church, Sussex (1940-42). 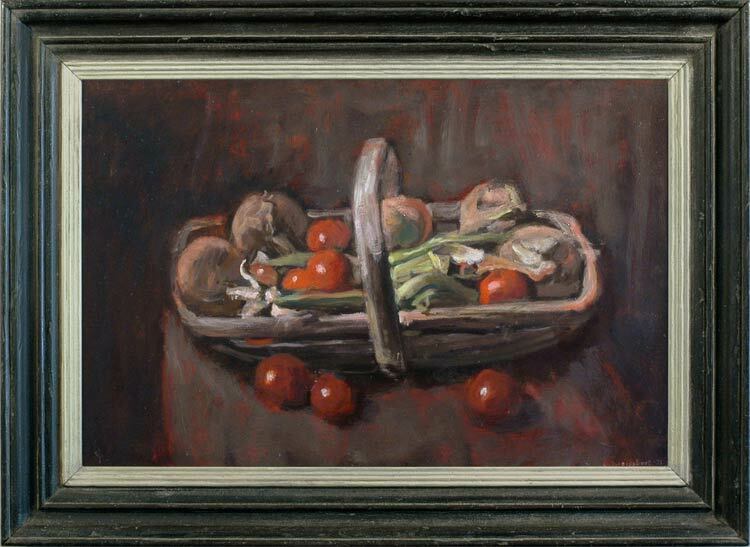 Weissbort, like Bell, uses the handle and boat-like shape of the trug to full advantage here as a foil for the rounded shapes of onions and tomatoes, and plays the richer colours of beans and tomatoes against the subdued browns, from mushroom to chestnut, of the rest.